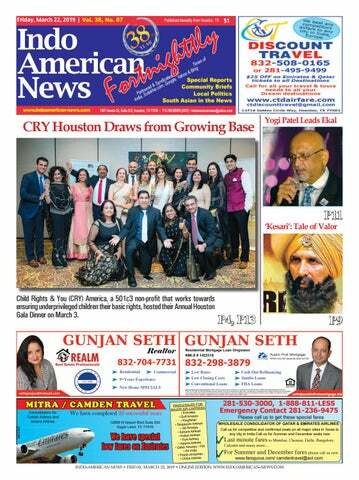 Child Rights & You (CRY) America, a 501c3 non-profit that works towards ensuring underprivileged children their basic rights, hosted their Annual Houston Gala Dinner on March 3. Organizers of CRY Houston and Gala Committee members take a bow at the function held on March 3 at the Sugar Land Marriott. America believes that “YOU” can empower children’s dreams and be ambassadors of change for children’s rights. Your support allows us to ensure that thousands of children are able to go to sleep educated, healthy and protected. With the support from over 25,000 donors & 2,000 volunteers, CRY America has transformed the lives of over 716,386 children across 3,755 villages and slums.” She appealed for people to join CRY America as donors, volunteers and supporters and visit http:// www.america.cry.org for more information. Dr. Sarita Mehta (above) spoke at the monthly meeting of Gujarati Sahtiya Sarita (right). published the book “Bal Gagan Vihar” based on daily incidents of special need children; Honorary Secretary Avani Mehta; and GSS Advisor Devika Druv, a poet who writes both in Gujarati and Hindi, and has written a few books, Dr. Sarita Mehta is the Chairperson for the newly formed Vidya Dham USA, which has recently signed a Memorandum of Understanding with the Government of Gujarat to teach Hindi, Gujarati, Sanskrit, Yoga and Ayurveda in her institution in the US. in children. Other speakers included Dr. Indu Shah, reciting a poem on Women Empowerment (Nari Shakti); Bhavana Desai delivering Phalgun geet and Navin Benkar, who wrote and published his first book in 1965, spoke on “Short Stories” (Laghu Katha). Others who spoke were Charuben Vyas, Prashant Munshaw, Janardan Shastri, Hasmukh Doshi, and Chiman Patel. CHECKUPS ARE GOOD FOR YOUR FINANCIAL HEALTH. Like annual physicals, a yearly financial checkup can help uncover hidden problems, inspire you to set new goals, provide information you need to improve your health, and help make sure you’re on track for well-being. I specialize in thoughtful and objective investment guidance aimed at keeping your finances and goals in shape. Securities offered through LPL Financial, Member FINRA/SIPC. Investment advice offered through Jaykay Wealth Advisors, Inc., a registered investment advisor and separate entity from LPL Financial. Shoba & Hiren Joshi with their chief sponsors and supporters at the Geetanjali Fundraising Gala on March 15 at India House. Shoba and Hiren Joshi extended their highest appreciation for the support to Geetanjali Radio to the Grand Sponsors Jugal and Raj Malani, Dawat Vatering for the delicious food, Krishna Sounds’ Darshak Thacker for the sound system, Touch of Elegance by Sara Dugal for decorations, Sudhakar Roy for photography, and Indo American News as well as the other Indian print and TV media for their year-round support. don, Britain March 20, 2019. REUTERS/Peter Nicholls India asked Britain last August to extradite Modi, 48, whose diamonds have sparkled on famous Hollywood stars, after he was accused of massive bank fraud, charges he denies. The diamond magnate was arrested in the Holborn area of central London on Tuesday after he went into a bank to open an account and a member of staff contacted police. On Wednesday, he appeared at London’s Westminster Magistrates Court accused by India of two charges of conspiracy to commit fraud and conspiracy to conceal criminal property. Power dialogue underway with Congressman Pete Olson (center). Rep. Olson is flanked on his right by IACCGH Executive Director Jagdip Ahluwalia and on his left by President Swapan Dhairyawan. Sanjay Rambhadran (left) being sworn in by Judge Ravi Sandill. non-partisan statewide leadership organization that identifies the next generation of Texas leaders, educates them on issues critical to the future of Texas and inspires them to action and stewardship. In his remarks, Sanjay Ramabhadran spoke about how his parents instilled in him the importance of community involvement and why civic engagement is an essential ingredient of his life. He emphasized the need to weave in the rich diversity of talents, thoughts and perspectives into the tapestry of Texas to ultimately result in public policy that is reflective of the values of all Texans. Speaking to the current polarization, he noted how the Lyceum, now more than ever, plays a critical role in convening leaders with diverse thoughts and perspectives. Yogi Patel is President of the Ekal Vidyalaya Houston chapter for 2019-2020. Senior Ekal Trustee M.L. Jain (left) receives the Gandhi Peace Prize from President Ram Nath Kovind as PM Narendra Modi looks on. educational opportunity to children in tribal areas and empowering rural women-folks. Currently, “EVF” has been supporting 82,000 Ekal-schools across rural-tribal pockets of India and grooming almost 2.2 million children – more than half of which are girls. at 12. All the SLCC bowlers and fielders brought their A game to the finals not allowing a single boundary in the Gladiators innings. Thusitha was the pick of the bowlers with 9/3 in his spell. The game was followed by prize distribution ceremony arranged by TCC and facilitated by Nanda Kumar, president of TCC. TCC and teams were honored to have Rajeshwari Dholakia Antani for presenting the awards. She is well known in the Houston cricket community and have had the privilege of representing Indian Women’s national team. Dushan Silvester, the captain of SLCC was presented with the championship trophy and Subodh Dongare, the captain of Gladiators was presented with the runners up trophy. Thusitha was adjudged man of the match for scoring 19 match winning runs and taking 3 wickets for 9 runs. For the tournament awards, Syed Mohiaddin was awarded the best batsman with 235 runs. Subramanya Upadhya was the best bowler for taking 16 wickets. Best wicket keeper award was shared by Swaroop CK, Debasish Das and Syed Mohiaddin for 17 dismissals. Anil Gorisipati was the best all-rounder with 179 runs and 8 wickets. Special award recipients were Prashant Manne and Sankirth Bathula for individual centuries and Vishnu Gardimalla and Joseph Alenchery for Hat-tricks. tend to gift the investment sum to a child studying in the US. After completion of studies, the EB-5 visa enables him or her to work without having to throw the hat in an H-1B lottery. Only 10,000 EB-5 visas are issued annually, with a 7% per country cap. If a country doesn’t meet the cap, the unused visa quota is redistributed to other countries. Currently, Chinese and Vietnamese investors are facing a retrogression (which arises when the applications exceed the cap set) and the waiting time for Chinese is nearly 14 years. 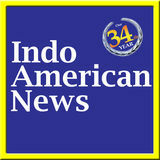 The current waiting period for Indians, to obtain a conditional green card after making an investment ranges roughly between 18 and 30 months, depending on how fast the application (526 petition) is approved. Indian investors too could face retrogression from July or August this year, which would increase the waiting time further by a few years. This will still be significantly shorter than the wait time for standard employment-based applications where the waiting time is 17-plus years. The US Department of State has also released figures of pending applications, as of September 30, 2018. The maximum pending applications were from China at 8,180, followed by 1,633 applications from India. Nozer Buchia (center) with his launch team from left: David Jones, Patricia Bermudez, Tara Bush and Casey Salge. failed and 20 per cent are happy you have failed. But I realized that there is no one definition of leadership, and GLUDES will define it,” he continued, adding “Leaders create leaders, they don’t create followers.” Nozer is an internationally acclaimed motivational, inspirational and keynote speaker with a passionate message. He and his wife Persis have been members of Houston’s Zoroastrian community for the past 16 years and have one son Kyrus (who is an ordained priest and a basketball player at Graceland University in Iowa). When he is not touring the globe for conferences or speaking engagements, Nozer visits Texas prisons to help rehabilitate inmates through motivational talks. Nozer outlined his plans for GLUDES as they work towards the accreditation process by partnering with other Universities to achieve their goal. GLUDES will provide leadership scholarships to deserving young wanna-beentrepreneurs and high school/ college students as a give-back to the community. He ended his motivational speech by stating “we all have equal opportunities… but we expect equal results… move your behind if you want to succeed!” was his final message to the audience.